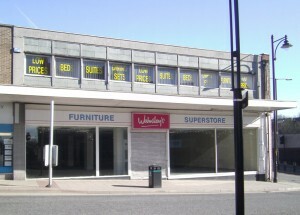 The empty Walmsley furniture store on Yorkshire St is set to become a YMCA charity shop and is situated directly opposite Dr Kershaws Charity shop which occupies the old Demolition clothing store. Just another example of Oldham Councils ailing business plans & mismanagement of Oldham Town Centre and other areas. Millions are being ploughed into turning Union St into a public funded illusionary cultural destination whilst the Council remains silent about established businesses that weathered years of road works and a complete loss of pedestrian business who have been offered a derisory 10% reduction in business rates as compensation. The traditional retail centre now occupies little more than the budget end of the retail marketplace, the charitable sector and the poverty driven high-interest loan – pawnbroker sector.